Straight Flush – Five cards in order, all of the same suit. 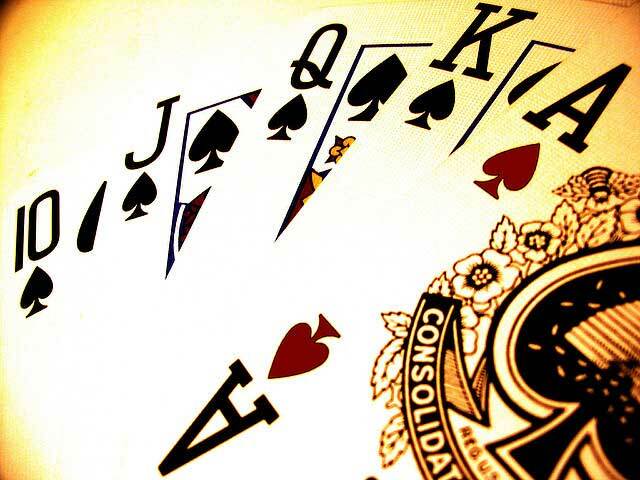 The highest possible hand is the Royal Flush, which is an Ace high Straight flush. Four of a Kind – Also called Quads. All four of a single rank plus a fifth “kicker” card. In the event of a tie, the higher kicker wins. Full House – also known as a "Boat". Three cards of one rank plus two cards of a second rank. If both players have a boat, the player with the higher ranked three cards wins. Flush – All five cards of a single suit. Highest ranked card wins. Straight – Five cards in numerical order. If both players have a straight, the higher straight wins. Three of a Kind – Three cards of the same rank. This is called a "Set" when two of the three cards are in your hand and "Trips" when two are on the board. Two Pair – Two cards of one rank plus two cards of another rank and a “kicker”. When both players have two pair, the player with the highest rank pair wins. If both have the same two pair, the higher kicker wins. One Pair – Two cards of a single rank. High Card – If none of the players have any of the above, the player with the highest card wins. If two players hold the same high card, then the next card in rank each has would then determine the winner.